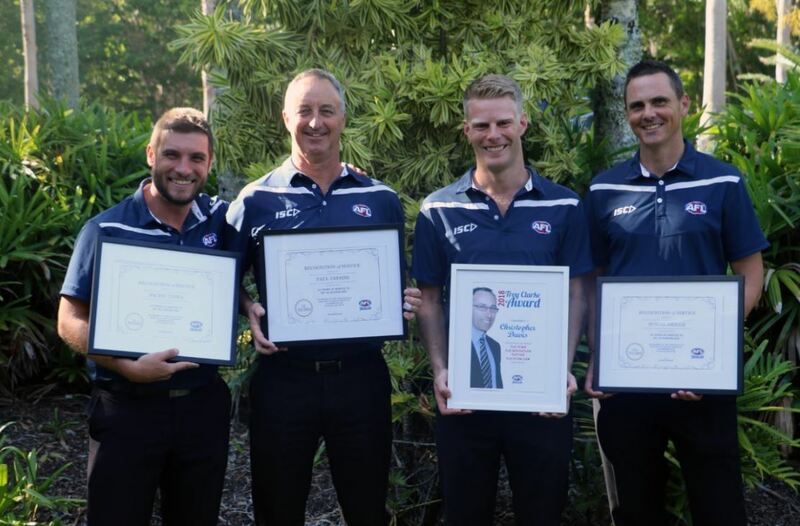 AFL Queensland’s Christopher Davis was announced the winner of the 2019 Troy Clarke Award at the AFL Queensland State Conference held on the Sunshine Coast last week. Davis became the sixth recipient of the award, named in honour of former AFL Queensland State Development Manager, Troy Clarke, who tragically passed away in late 2013. The award was announced in front of over 80 AFL Queensland staff at the Novotel Twin Waters Resort Sunshine Coast. “It was probably almost shock. We’ve got a fantastic team across the whole business. It was a bit of a shock and surprise I think,” Davis said following the presentation. Competition & Club Development Manager QAFL & Colts, Davis oversees both the Queensland Australian Football League and affiliate Colts competitions. Among his initiatives, Davis has contributed to developing and implementing the 2019 QAFL Salary Cap and points system which will be rolled out in the QAFL this coming season. His governance of the state’s premier football competition has also seen him take a lead in a financial benchmarking project for all nine QAFL clubs. For the first time; through Davis’ leadership, QAFL games were able to be live-streamed to an audience of over 55,000. Following the announcement of the Troy Clarke Award winner, Davis said bringing the QAFL to a wider audience was the thing he was most proud of. “We were able to take an idea and turn it into something which had fantastic viewership throughout the year,” he said. “It was a way of bringing the competition to more people and certainly the interest and then the development of our volunteer commentators was amazing. Davis also played a key role in the delivery of the Grogan Medal and Community Football Awards nights and represented AFL Queensland at the AFL’s Future Leaders Program. Throughout the home and away season, Davis oversaw Umpire Appreciation Round delivered across AFL Queensland’s various community football leagues. In a true demonstration of his passion and commitment Davis would personally deliver QAFL Rising Star Award nominees with their medals at training during the week. The Troy Clarke Award is named in honour of former AFL Queensland employee Troy Clarke who passed away from coronary atherosclerosis in October 2013. Clarke played 68 games with the Brisbane Bears between 1991 and 1996 and was the only North Queenslander named in the AFL Queensland Team of the Century shortlist. Following his retirement from football, Clarke held various positions in game development and in 1999, became Gold Coast Development Manager where he oversaw the region transform into one of the richest talent sources in the AFL. In 2011, Clarke became the AFL Queensland State Development Manager and in 2008, he was inducted into the AFL Queensland Hall of Fame. 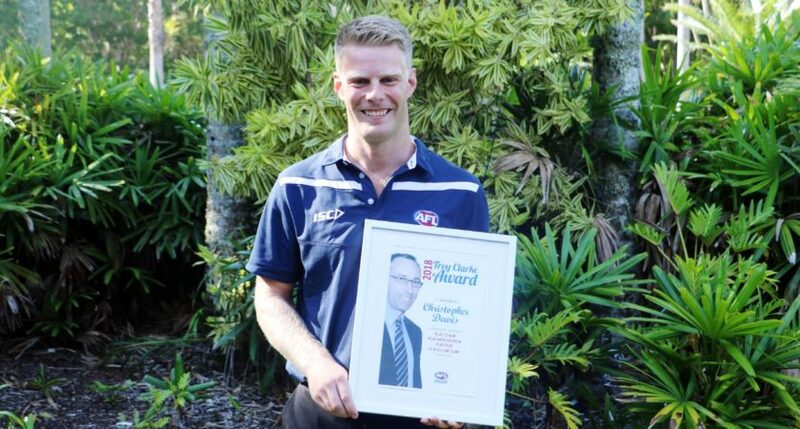 Since his passing, AFL Queensland continued to recognise his legacy by bestowing the Troy Clarke Award to an employee within the organisation who shows outstanding service while showcasing the traits Clarke exhibited every day. AFL Queensland would like to congratulate Christopher Davis on his achievement.